Endocrine is the collection of glands which produce hormones to regulate processes such as growth and development, reproduction and sexual function, metabolism and mood and sleep. The word Endocrine originated from the Greek words “‘endo’ meaning within and ‘crinis’ meaning ‘secrete. These glands remove materials from the blood and process and secretes necessary product for use elsewhere in the body. Hormones produced by these glands circulate throughout the body and each hormone is marked toward specific organs and tissues. Diseases occur when the hormone levels are either too high or too low. If the body does not respond to hormonal changes appropriately. What is the exocrine system? Similar to endocrine system, exocrine system is made up of glands that produce and secrete substances to protect or lubricate the human body. There are numerous conditions may affect the exocrine system and lead to over or under secretion of these glands. The endocrine system and the exocrine system are closely associated with each other and there are times, some of the diseases witnessed in the endocrine system are also can been identified in the exocrine system. Exocrine glands are glands that secrete their products through the ducts, and discharge it into the external environment, to organs or the outside the body. Endocrine glands are ductless, therefore the secreted hormones are released into the interstitial spaces that surround the cells. The hormones are delivered to the nearest capillaries, and spread throughout the body. The responses are delayed because hormones must first travel through the blood to reach the target organs. The duration is longer because the kidneys filter the blood. The functions of the endocrine are interrelated. Many of the hormones generated serve to alter the work of other endocrine hormones. Exocrine glands differ from endocrine glands, because they have ducts that deliver the products in the superficial part of the body, such as the skin, or in the inner part where they are necessary, such as the pancreatic juice that is carried into the intestine to aid digestion. The glands that are found in the body are mostly exocrine glands. Examples of exocrine glands are sweat, saliva and mammary glands, as well as oil and enzymes. There are glands which function as both endocrine and exocrine glands. The endocrine system is also one of the body’s most important systems, especially with the control of the body’s functions. This is how the body communicates and coordinates with the nervous system, reproductive system, pancreas, liver, kidneys and fat to maintain balance, or homeostasis, with reproduction, growth and development, and energy levels and responses to external stress and injury. Endocrine glands produce hormones that can be used inside the body. The endocrine transmits the hormonal messages to cells by secreting them into the blood and extracellular fluid. A receptor is needed in order to receive the message transmitted. The target points may be cells, tissues or organs. 1. Exocrine glands have ducts to carry secreted subtances to the rest of the body, while endocrine glands are ductless. 2. Exocrine glands release subtances into the external environment, or outside of the body. Endocrine hormones are released into the internal environment, or inside of the body. 3. Exocrine glands have sub-classifications. 4. Endocrine response is slower because hormones travel through the blood. 5. The duration in endocrine transmission is prolonged because kidneys have to filter the blood. Ian F. "Difference Between Exocrine and Endocrine." DifferenceBetween.net. September 11, 2017 < http://www.differencebetween.net/science/health/difference-between-exocrine-and-endocrine/ >. I agree with the comment that exocrine glands do not release hormones. The paragraph containing this statement is beset with some serious confusions. Exocrine glands secrete “products” such as tears, sweat, saliva, urine, and vaginal fluids. The descriptions of merocrine, holocrine and apocrine need clearer definitions . 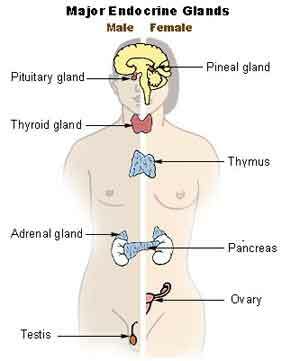 It is endocrine glands that release their hormones into surrounding tissue and vessels. Please correct the summary statements too. Thank you for this good explanation ..